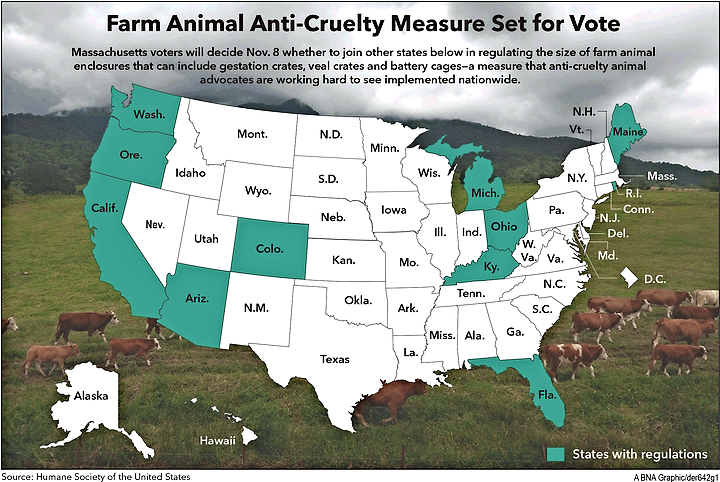 Oct. 17 — Massachusetts may join 11 other states in establishing anti-cruelty rules increasing the size of certain farm animal enclosures and regulating the sale of products from animals raised in extreme confinement—an effort spearheaded nationwide by animal rights groups. Question 3 is on the Nov. 8 ballot in the Bay State, a referendum that would prohibit egg-laying hens, calves raised for veal and breeding pigs from being housed in enclosures that prevent the animals from lying down, standing up, fully extending its limbs or turning around freely. The measure would apply to animals and sales of products from them raised in Massachusetts and similar animal products made in other states. The referendum would establish a maximum $1,000 fine for each violation. Voters are likely to approve the initiative. In three separate polls in the state, more than 60 percent of respondents supported the initiative. The ballot initiative marks the latest effort in a years-long campaign by animal rights groups to put laws on the books banning restrictive farm animal enclosures either by ballot referendum or through the statehouse. Though most states in which efforts have been successful are not top producers of pork or poultry, the strategy aims to expand similar language to major farm states, advocates and opponents of the Massachusetts initiative both say. Supporters of the initiative say that adopting Question 3 would limit cruelty to animals. “If you were to force dogs and cats to live in these cages where they couldn’t even turn around their entire lives, it would be illegal, yet because the victims are chickens and pigs, it goes on,” Paul Shapiro, vice president of farm animal protection at the Humane Society of the United States, told Bloomberg BNA. Specifically, Shapiro and the Humane Society are targeting battery cages and gestation crates, both mainstays of large-scale farming in the U.S. In battery cages, egg-laying hens are arranged in rows of wire enclosures. Critics point out that the space per hen amounts to less than a sheet of printer paper, though farmers say that segregating hens from one another is crucial, as some may become aggressive. Female pigs, or sows, are often housed in gestation crates, narrow metal enclosures in which they spend months at a time. Groups like the Humane Society say they constitute animal abuse, though farmers say that the crates are needed to prevent sows from fighting and to administer individual medical care to the animal. Shapiro has helped spearhead the ballot initiative and successfully pushed through similar laws in Arizona, California, Florida and other states. And he will likely be successful in Massachusetts as well. A September poll conducted by the University of Massachusetts and the WBZ radio station put support for the initiative at 75 percent among likely voters. The Humane Society marshalled more than 100,000 residents to sign a petition putting the measure on the ballot and has enlisted celebrities such as former World Wrestling Entertainment star Daniel Bryan, who is featured in a Humane Society-sponsored YouTube video, to lend their name to the cause. In addition to grassroots campaign efforts like bumper stickers and phone banks, Shapiro said the Humane Society will purchase a seven-figure ad to support Question 3 at the ballot box. Massachusetts is not an obvious choice for launching a campaign banning restrictive farm animal enclosures. The impact on farming within the state would be small. According to the Massachusetts Farm Bureau Federation, no pork facilities in the state use gestation crates, and only one egg farm uses battery cages. But Massachusetts imports much of its pork, veal and poultry, so rules on animal enclosures could extend to farm states where similar regulations may be difficult to pass. And for the Humane Society, the initiative is also part of a nationwide effort to pick off individual states to help increase political momentum for the cause. The group's state-by-state strategy stems from the organization's failed fight to include similar language in the 2014 federal farm bill, Shapiro said. “There’s less optimism about federal legislation to protect animals on factory farms at this time because of that experience,” he said. Many farm groups oppose the Massachusetts initiative, arguing that the rule would limit farmers' ability to raise their animals in the way they see best. “It’s going to dictate to farmers the best way to raise and care for their animals, rather than letting farmers do it, who do this every single day,” Dave Warner, director of communications at the National Pork Producers Council, told Bloomberg BNA. The new regulation would increase operating costs for farmers, which get passed down to the consumer, opponents say. Farmers who want to sell in Massachusetts would have to retrofit their facilities comply with the larger enclosure requirements. “The ballot as written contains a huge flaw which would set the standard for cage-free for Massachusetts 50 percent higher than it is for any other industry, and so the eggs that would be sold into Massachusetts would be produced under more expensive conditions,” Bill Bell, general manager for the New England Brown Egg Council, told Bloomberg BNA. Opponents also say that the free market would best resolve the issue. Major food retailers like Wal-Mart Stores Inc. and McDonald’s Corp. have pledged to offer only cage-free eggs within a few years, though Shapiro and others point to those companies' decisions as evidence that the impact on operating costs would be minimal. But opponents know increased costs for farmers is a tough argument to bring to voters in a largely urban state, so they're making another point: higher food prices would hit Massachusetts' poorest citizens the hardest. Sullivan, an anti-poverty advocate from Medford, Mass., said that the Humane Society's ambition to roll out similar rules across the country doesn't serve Massachusetts voters well, and disputes the pro-Question 3 camp's claim that the price increase would amount to only one cent per egg. In April, Sullivan sued to have the initiative removed from the ballot, but the Massachusetts Supreme Court rejected the move. Compared to the Humane Society, Sullivan is operating on a shoestring budget. According to an Oct. 5 filing to the Massachusetts Office of Campaign and Political Finance, Sullivan's group posted receipts of just more than $75,000, almost all of that coming from one man, Forrest Lucas, founder and chief executive officer of Corona, Calif.-based Lucas Oil Products, Inc.
Lucas is also founder of Protect the Harvest, an advocacy group backing the interests of farmers and hunters and an outspoken critic of the Humane Society. Though Sullivan acknowledges she's outgunned by pro-Question 3 groups—she characterizes her fight as “Dianne versus Goliath”—and says that while polling indicates voters are likely to adopt the initiative, she will continue her campaign. To see the “Act to Prevent Cruelty to Farm Animals” petition, go to http://www.mass.gov/ago/docs/government/2015-petitions/15-11.pdf.